Feeeeeeeeeeelings trumps scientific biological reality. From Daily Mail: You might have thought it was the most innocuous item someone could wear: a simple black T-shirt bearing the dictionary definition of woman as ‘human female’. But a young mother has been barred from her local pub after a complaint that the words discriminated against transgender people. 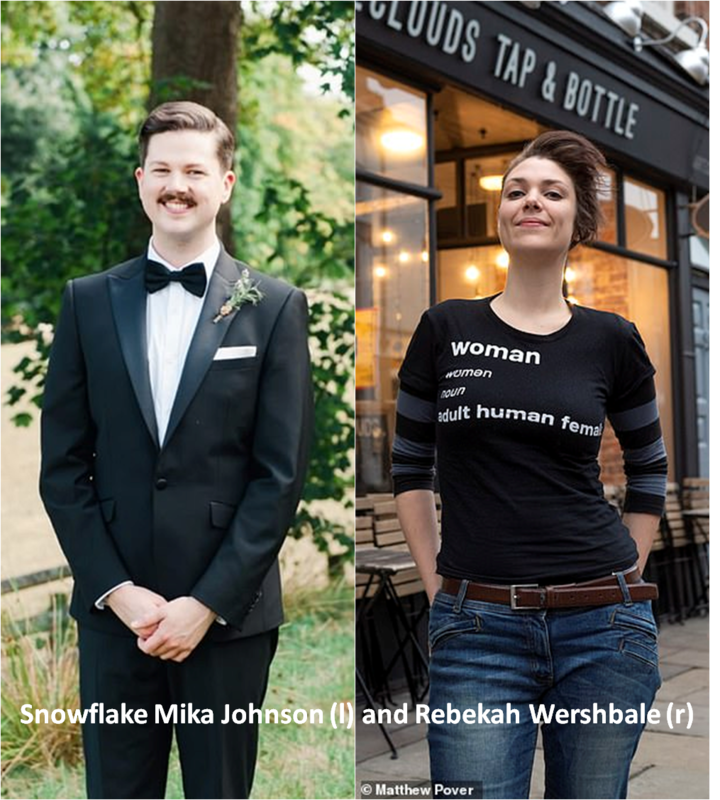 The unlikely new front line of the ongoing war between feminists and transgender campaigners is the snug Five Clouds Tap and Bottle in the historic market town of Macclesfield (England). Rebekah Wershbale said she was ‘stunned’ when a barwoman at the pub informed her she was banned because of the definition. Ms. Wershbale is a supporter of feminist group Fair Play For Women, which opposed a Government’s consultation to reform the Gender Recognition Act (GRA). This proposed legal change would allow people to self-identify as the gender they believe they are without any medical diagnosis. Feminists and transgender campaigners have been locked in an increasingly heated battle with leading feminists fearing the change will harm the safety and privacy of women. Ms. Wershbale, a mother-of-one, had gone last Sunday with her girlfriend to play board games at the pub where she has been a regular for three years. But the 34-year-old was surprised to be approached by a member of staff with a complaint. Nothing out of the ordinary had happened that evening, except when she spoke to another drinker at the pub, a gay man called Mika Johnson. Thirty minutes later a member of the bar staff named Heather came to Ms. Wershbale’s table to tell her she was no longer welcome at the pub. ‘Heather said I’d been upsetting people and Mika was crying,’ Ms. Wershbale said. ‘She told me that the way I talk about radical feminism was a problem and said: “The T-shirt you’re wearing is upsetting and not inclusive.” I replied that it simply said the dictionary definition of being a woman – how can it be offensive? ‘She mumbled a bit about it being transphobic and that I had been transphobic previously. She then said I was barred and that she had been nominated by the other bar staff to come to tell me that. The owner of Five Clouds Tap and Bottle Brewery Tom Lewis confirmed Ms. Wershbale had been ordered to leave after the complaint. But he said there had been a series of incidents where she had upset staff and customers by challenging them about their views on men identifying as female. The manager of Five Clouds Tom Lewis said Ms. Wershbale is not permanently barred but she must ‘have a discussion with staff so she understands the situation’ before she is allowed back in. Ms. Wershbale said the claims were ‘untrue’ and an attempt to smear her. She admitted that while at the Five Clouds she had promoted a feminist campaign by Fair Play For Women. However, she insisted she was not transphobic and is only against the reform of the law because she believes it could put women’s safety at risk by allowing men who say they are female access to women-only spaces.